Here is my harvest. I know it probably doesn’t look like much but this was just one small seed potato that I used. Next year, I will start earlier and plant more potatoes so my bounty is bigger. But overall I was happy with the results of growing the potatoes in straw. Tanya @ A Little Bit of Everything! Love this idea! I think I’ll give it a try myself next year with some sweet potatoes. Thanks for all the info. 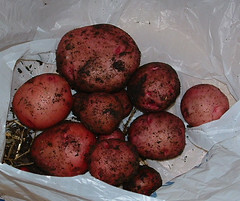 Oh, how neat, I did potatoes this year but they did not do well. I think you have given me a better option. I have used old tires to plant my potatoes in. Just fill with soil, plant seed potatoes and add soil as they grow. Add another tire and soil etc. as the plants grow bigger. (A friend painted the outside of his tires so they would look better.) Stack them as high as you want and when the plant starts dying off knock it down and enjoy your potatoes. Also use five gallon buckets with holes drilled on sides to plant hanging tomatoes etc. These are beautiful potatoes Cindy! 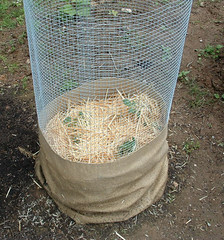 We tried something similar this year using stacked tyres filled with compost – didn’t look as nice as your chicken wire and burlap stack but we got some nice potatoes 🙂 The first time we tried we didn’t get many either, I think starting them early and having good seed potatoes makes a difference. So that was your first time harvesting potatoes? Very cool! What is meant by “seed potatoes”. Does this mean potatoes with “eyes” or buds? Thanks in advance for your answer. Linda: Seed potatoes are normally treated and tested for disease and aren’t the same as the ones you eat. Generally seed potatoes are certified to be disease free as potato plants can carry many potato diseases: bacterial, viral, and fungal; and some of these are passed on through potato tubers. Here is a post that talks about some of the differences. Hope this helps. I don’t know how much I’m ready to attempt your treasure-trove of projects, but I’m at the point where I need a creativity-jog, and am grateful to have found your website. On the potatoes – I was planning to try again, using above-ground methods – I have had success laying potatoes on the top of the ground, and then covering as they grew – but enclosing the lot is both more deliberate and probably successful. I had had potatoes, in-ground for several years with great success – rotated the plots, and then – nothing. Fingers crossed for this year. Thank you. Jane – Thank you so much for sharing your thoughts and ideas for potatoes this season. I recently planted some potatoes and in some dirt mounds and put a fence ring around them to keep the turkeys and deer away from them. Hopefully they will do well this year with this method.